The construction of Mauritius Airport New Terminal started in 2010 and it is now fully operational. 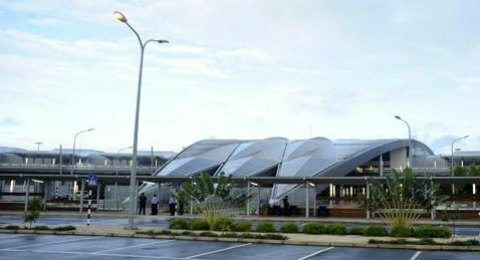 Prime Minister Dr. Navinchandra Ramgoolam officially inaugurated the new terminal of Mauritius Airport on 30 August 2013 and the shifting of operations from the old building took place on the night of 11 till the early morning of 12 September 2013. Air Mauritius, carrying 275 passengers from Charles de Gaulle, was the first plane to land at 6 in the morning and roughly three hours later checked-in passengers boarded for Johannesburg. The eleven billion rupees extension to the actual Sir Seewoosagur Ramgoolam International Airport covers an area of 56 900 square metres and can handle a total of 4.5 million passengers per year. Airports of Mauritius Limited (AML) and Aéroports de Paris Management (ADPM) partnered in a joint venture for this project which is now managed by Airport Terminal Operations Limited (ATOL) – a subsidiary of AML. ATOL is a private company and its shareholders are Airports of Mauritius Ltd (90%) and Aéroports de Paris Management (10%). Designed to be environmentally friendly and linked to the “Mauritius sustainable island” concept, the building maximizes the use of natural light. Apart from the installation of monocrystalline solar modules rain water is collected for the patios and sanitary blocks. Part of the ground floor is allocated to tour operators and Customs officials. The remaining area covers the baggage hall. Besides a dedicated circuit for incoming passengers, check-in formalities is done on the first floor. Passengers will then proceed through the duty free shopping zone to the departure hall. Five boarding bridges are installed; three of which are capable to service the Airbus A380. The second floor, with large glass windows, is designed to accommodate a Well-wishers Hall and a restaurant. From here you will have a magnificent view of the landing and take-off of airplanes. Louis Berger Group (LBG) and the China State Construction Engineering Corporations (CSCEC) also contributed their expertise in the realization of the project. SSR International Airport's runway has also been upgraded at a cost of one billion rupees. The airstrip has been enlarged on both sides and the pavement surface reinforced. Large aircraft like Airbus A380 and Boeing 787 can now land at Mauritius Airport.